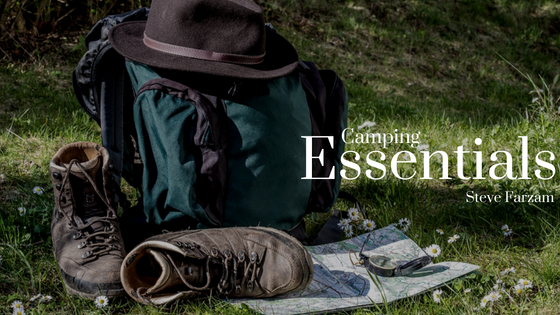 While preparing for a camping trip, it is easy to forget a necessity or two, such as aspirin or a flashlight. To prevent traveling without a much-needed item, spend some time putting together an essentials bag, containing the vital items you will need to ensure your trip is seamless. Consider adding some of these items to your must-bring bag. Whether you are at the campsite or out in the woods, it is important to have a first aid kit with you. It is easy to get a scratch or cut from hiking through trees, or accidentally get a burn from stoking the fire. Having a first aid kit in your essentials bag will help ensure any of these wounds are taken care of properly. Going on a hike is all fun and games until you realize you’ve been out in the woods a lot longer than you imagined and you’re chasing the sun back to your destination because you don’t have an additional light source. Be sure to pack a flashlight, lantern, and/or headlamp so you don’t get lost in the woods after dark. It’s also helpful to have one stashed in the car for easy access in the event that you arrive at your campsite at night. Many remote camping spots and most areas within the forest do not provide a signal for you to use your GPS on your phone or in the car. Even if you are able to manage to get a small signal, the chances of your battery dying down during use are likely. Ensure you do not get lost by bringing paper maps and a compass. A pocket knife, or Swiss Army Knife, is an essential tool for camping, and it takes up virtually no space in your bag. Containing a knife, corkscrew, small scissors, a saw, and more, this tool will come in handy for a variety of scenarios. Even though the weather forecast says it will be sunny for the entirety of your trip, the weather is finicky and can change quickly. Make sure you pack a rain jacket and an extra change of clothes that you can swap out in the event they get wet. Easy to fold and taking up little space, tarps are great for protecting the bottom of your tent, adding extra shelter, and keeping your campsite table and chairs covered when it rains. Not only is rope great to string up and hang wet clothes and towels, it also comes in handy for hanging lanterns to better illuminate your campsite, create a shelter using your tarp, or towing people out. If you are able to tie a variety of knots, even better. Matches are vital to a camping trip to help you start a fire. Without a fire, it will be difficult to cook food and your nights will be a lot colder. Don’t take the chance of solely bring a lighter, as they run out of fluid eventually. Instead, buy matches in bulk so you have them for your trips, years at a time.